Magnetique Shelves – A Perfect Combination Of Form And Function | OhGizmo! With a set of Magnetique shelves at home, you can decide how the shelf looks and functions instead of being forced into organizational conformity by some Swedish IKEA designer. The shelves use a metal sheet that can be mounted horizontally or vertically on your wall, and a collection of magnetically backed boxes that can be attached in any position. Even if everyone on your block has a set of Magnetique shelves at home, you can still be unique since there’s almost an infinite number of ways you can arrange the boxes. While I’m still a bit cautious when it comes to mixing magnets and electronics, the shelves seem useful for holding books or non-magnetic based media. (Up to 6lbs.) So keep those VHS tapes, cassettes, reel-to-reels and floppy disks well away from it. 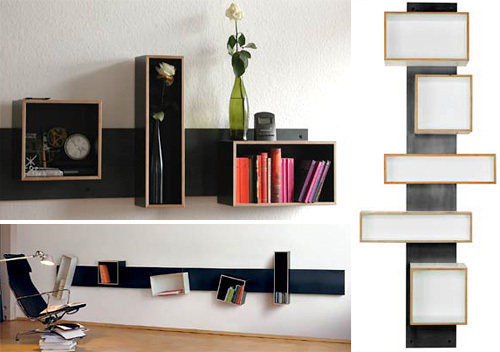 The Magnetique shelves come in a variety of sets that differ in the shapes and number of included boxes. They range in price from about $1,230 up to about $2,150. “about $1,230 up to about $2,150” are they nuts? Old hard drive magnets a long sheet of steel and a bunch of boxes all of a sudden set you back a couple of grand?